Clear skies. Low 57F. Winds light and variable..
Every once in a while we come across a traditional Spanish eatery. They always seem to be loaded with surprises and have lots of luscious and varied dishes. Contigo is such a place and there are foods here from Mexico, Cuba and South America as well. Here you’ll find tapas, hot and cold soups, salads and all the way to entrees such as paella (featuring chicken, shellfish, chorizo or rabbit) and ending with whole, suckling pig. Granted, the last two items are for sharing and need to be ordered in advance. Here everything is gauged “with you” in mind. The literal translation for Contigo from Spanish to English is “with you”. Many of us will remember J-Bar occupying this space on the grounds at La Paloma. The entrance is a short walk from the main resort lobby and close to all kinds of parking. The restaurant interior is warm and laid back. The main dining room sweeps around the bar area. Outdoor dining is also available on an L-shaped terrace. There are overlooks to city lights and sunsets too. The wine list features reds and whites of Spanish and South American origin. Full bar service is a step away and includes a number of foreign and domestic beers (on tap too). A Pilsner from Barcelona was a great accompaniment to the tasty dinner faire. Contigo’s menu begins with tapas in traditional, small plate portions. We sampled the shrimp in garlic sauce served with baguette toast. The sauce was more broth-like, but flavorful and rich…good sized, tender shrimp included. Another memorable highlight was the fresh and naturally sweet elote. This dish of grilled corn kernels has just the right blend of cheese, light spices and butter. Rave reviews from all on that! We also tasted the house gazpacho. It is loaded with pureed veggies with a hint of citrus. It is tasty, moderately seasoned and refreshing. This cold soup arrives in a cocktail glass and spoon. Our party enjoyed a number of entrees. We chose the pescado of the day, red snapper. The fish was fresh tasting, nicely presented and paired with sautéed squash. We also enjoyed the pan-seared duck breast with rice and mole sauce. The Muscovy duck was plump and cooked to order. Ole for the mole too!! It had hints of chocolate, coffee and smoked peppers. Great dish. Another wonderful entrée was the plate of lamb chops. They arrived grilled to order along with fries. 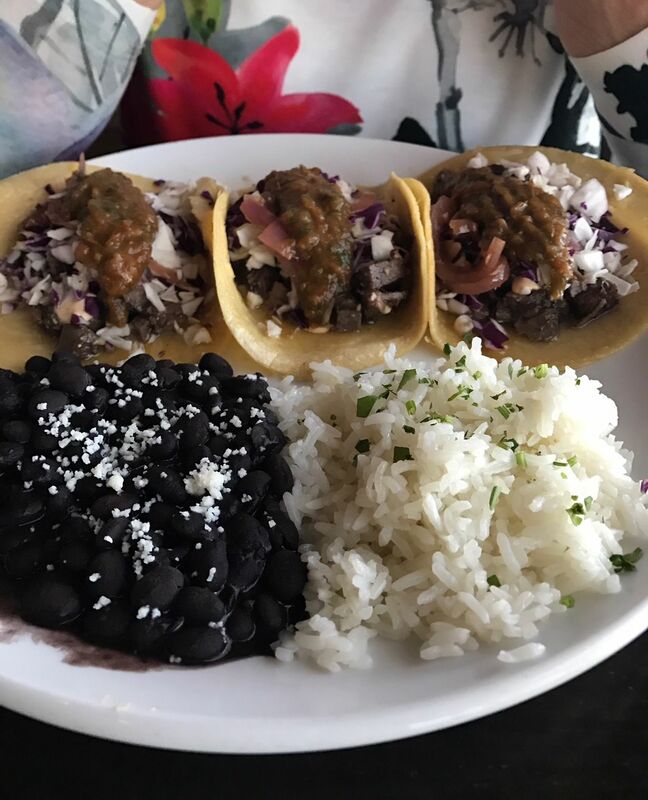 And we couldn’t pass up the short rib tacos. They were tender and tastefully complemented by grilled tomato salsa and pickled onions. Other highlights from the dinner menu include: slow-roasted pork shoulder, house made pasta and rib eye steak. As a finale we saved just enough room to share an order of house made beignets served with a creamy chocolate ganache. The pastries are bite-sized and airy and come five to a plate…a light treat at the end of a very good meal. Espresso, cappuccino and coffee are also available. Entrée prices range from $16 for the taco plate to $36 for rib eye steak. As mentioned earlier, paella is available with an advanced order as is the suckling pig for a larger dining group. The complete menu and other details can be found at the Contigo website at: www.eatatcontigo.com. Contigo Latin Kitchen is located at the Westin La Paloma Resort at 3770 East Sunrise Drive. Reservations are recommended. We found Contigo to be friendly, tasty and very good quality food and service.